Removable thermomolded front, rear, and side panels. User-friendly adjustable locking system in the front. The M-Brace M-Spine Brace #574 provides full length, breathable support for a variety of back injuries. The M-Brace 574 features heat moldable, removable anterior, posterior, and side panels for providing post surgical patients, or those with multi level injuries, a higher degree of trunk stabilization not normally found in other products. The M-Spine brace features breathable cotton velour construction that breathes to keep patients cool and dry inside. The rear has eight plastic covered steal stays to provide ample support and motion restriction should the thermomoldable panels be removed. This makes the LSO a great modular design that can be adjusted as patients are going through different phases of recovery following spine surgery. The M-Spine brace provides support from the T9 (thoracic) level down to your sacrum. The 6 locking straps in the front pull the brace in closer and provide a great fit from top to bottom. This product can be used to treat degenerative disc disease, burst fractures, recovery after spinal stabilization surgery, lumbar spinal surgery, spinal stenosis, osteoporosis, and disc protrusions. For a breathable product that offers a high level of support, the M-Brace 574 is a great choice for a variety of patients. Adjustable/removable thermomoldable front, rear and side panels is what differentiates this model from the #572 model. Eight flexible plastic-covered steel inner stays in the rear. User friendly and adjustable locking system across the front. M-Spine brace is lightweight and breathable. · Removable thermomolded front, rear, and side panels. · Breathable cotton velour construction. · User-friendly adjustable locking system in the front. 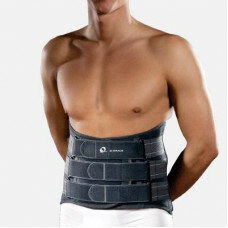 - See more at: http://www.dme-direct.com/m-brace-spine-brace-lso-574-lumbar-sacral#sthash.NuJ2J6Hb. The M-Brace M-Spine Brace #574 provides full length, breathable support for a variety of back injuries. The M-Brace 574 features heat moldable, removable anterior, posterior, and side panels for providing post surgical patients, or those with multi level injuries, a higher degree of trunk stabilization not normally found in other products. The M-Spine brace features breathable cotton velour construction that breathes to keep patients cool and dry inside. The rear has eight plastic covered steal stays to provide ample support and motion restriction should the thermomoldable panels be removed. This mThe M-Brace M-Spine Brace #574 provides full length, breathable support for a variety of back injuries. The M-Brace 574 features heat moldable, removable anterior, posterior, and side panels for providing post surgical patients, or those with multi level injuries, a higher degree of trunk stabilization not normally found in other products. The M-Spine brace features breathable cotton velour construction that breathes to keep patients cool and dry inside. The rear has eight plastic covered steal stays to provide ample support and motion restriction should the thermomoldable panels be removed. This makes the LSO a great modular design that can be adjusted as patients are going through different phases of recovery following spine surgery. The M-Spine brace provides support from the T9 (thoracic) level down to your sacrum. The 6 locking straps in the front pull the brace in closer and provide a great fit from top to bottom. This product can be used to treat degenerative disc disease, burst fractures, recovery after spinal stabilization surgery, lumbar spinal surgery, spinal stenosis, osteoporosis, and disc protrusions. For a breathable product that offers a high level of support, the M-Brace 574 is a great choice for a variety of patients. kes the LSO a great modular design that can be adjusted as patients are going through different phases of recovery following spine surgery. 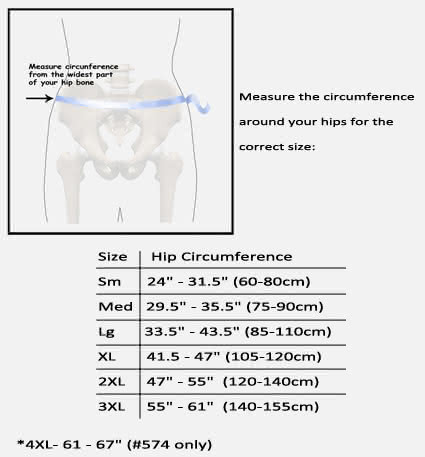 The M-Spine brace provides support from the T9 (thoracic) level down to your sacrum. The 6 locking straps in the front pull the brace in closer and provide a great fit from top to bottom. This product can be used to treat degenerative disc disease, burst fractures, recovery after spinal stabilization surgery, lumbar spinal surgery, spinal stenosis, osteoporosis, and disc protrusions. For a breathable product that offers a high level of support, the M-Brace 574 is a great choice for a variety of patients.